Christmas with Snowman Paul is a heartwarming story showing empathy and helping others. What were some important themes you wanted to capture in this book? I wanted my story to resonate with themes that address the true meaning of the holiday season such as friendship, inclusion, and family. The appeal of these values is in many ways near universal. My hope was that the story will raise questions such as: What does it mean to be a best friend? How does it feel to be excluded on a major holiday? Should we try harder to come up with imaginative solutions to problems of exclusion which seem, at first sight, insoluble? At the same time, I tried to address these themes with a fresh perspective and in a gentle, engaging and humorous way. Ultimately, this is a simple story that encourages children of all ages to be sensitive to the needs of those who feel lonely and have no one to celebrate with. The illustrations in this book are fantastic and serve to compliment the story. What was the art collaboration like with Joanna Pasek? Collaborating with Joanna Pasek has been sheer joy from the very beginning. What I admire most in Joanna’s work is her unmatched ability to capture the emotional core of our key characters. The dog, for instance, is a key character that did not appear in my original text and was entirely Joanna’s creation. As an author, I always know that Joanna will find the best ways to match the narrative with compelling images which do not only illustrate the stories but also compliment them in new exciting ways. This holds true even in cases where text requires her to perform very difficult, and sometimes seemingly impossible, illustrations. Click this link http://bit.ly/2ARLuE7 to see Joanna’s magic in action. The story is told in rhyme. Do you find kids learn language easier with rhymes? Most definitely! Rhyme is one of the most effective ways to install the love of reading at an early age. It helps keep attention, enhance retention and enrich vocabularies. Children love rhymes because they are musical and amusing and because they help them anticipate what is coming next. The timeless appeal of nursery rhymes, for instance, can be explained by these attributes. The instinct to rhyme was with me from a very early age but, I think, it comes naturally to most children. What is the next Snowman Paul story you have in the works? 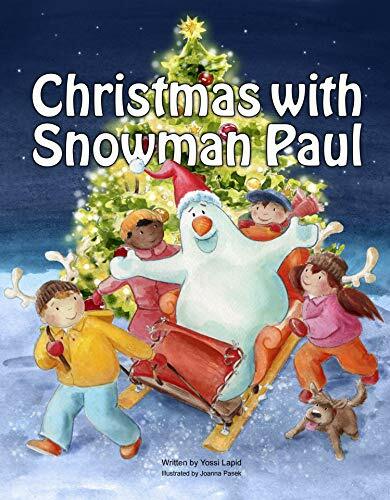 First, I would like to encourage Snowman Paul friends to check out the other nine volumes already published in the Snowman Paul series (https://author.amazon.com/books). But there are many other new adventures in store for Snowman Paul some of which are already written and eagerly awaiting their turn to be published. In addition, Joanna and I are just about to come out with a new picture books series titled “Yara, the Jungle Girl”. If you like Snowman Paul, you are likely to fall in love with Yara! Join Snowman Paul on this heart-warming and humorous Christmas Eve adventure!